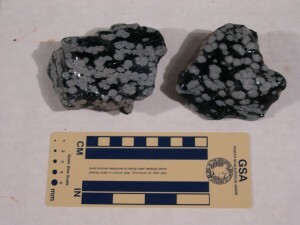 Snowflake obsidian collected in the Black Spring area, Black Rock Desert, Millard County. 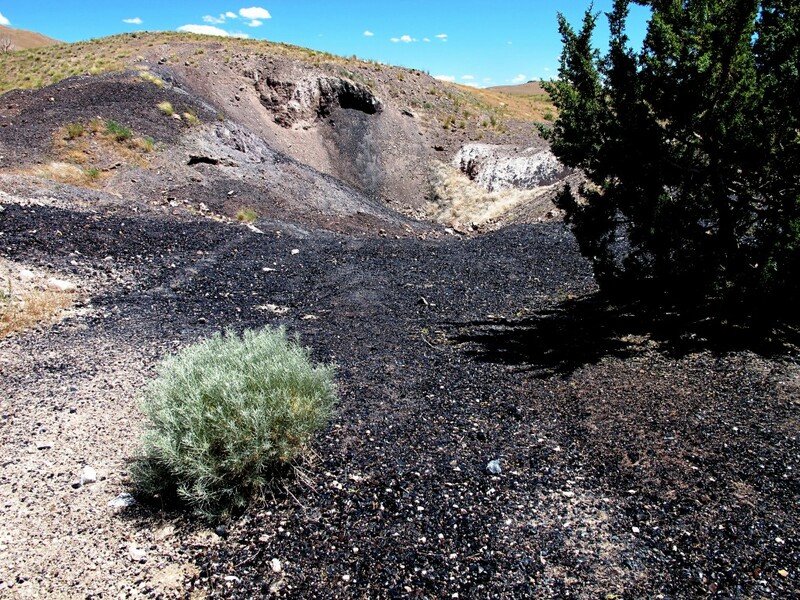 Approximately 2.5 million years ago (late Tertiary Period), volcanic eruptions in the Black Spring area of the Black Rock Desert in western Utah spewed out the volcanic rocks rhyolite, pumice, and obsidian. Obsidian is a dark-colored volcanic glass formed when molten lava cools quickly. It is usually black but colored varieties range from brown to red. Snowflake obsidian, a black obsidian with whitish-gray spots (spherulites) of radiating needle-shaped cristobalite (high-temperature quartz) crystals, is also found in the Black Rock Desert. Obsidian has been used for arrowheads and primitive cutting tools, and is presently used for jewelry. From the west edge of Delta, Utah, travel west on U.S. Highway 6/50 about 4.3 miles to the State Highway 257 junction. Turn south on highway 257 and travel approximately 43 miles to a BLM sign displaying “Kanosh 26” and a dirt road heading east. Turn east onto the dirt road and travel about 6 miles to the sign for Black Spring. Turn right onto the Black Spring dirt road and park in the open area across from the watering trough. Walk in any direction and obsidian can be found on the ground. Most pieces are black and range from 1/2 to 6 inches in diameter, but some reddish-brown and snowflake obsidian can be found. Richfield 1:100,000- scale topographic map, Cruz 7.5- minute topographic map, Bureau of Land Management (BLM) Recreation and Vehicle Guide to Warm Springs Resource Area map, and Utah highway map. Topographic maps can be obtained from the Utah Geological Survey, 2363 South Foothill Drive, Salt Lake City, (801) 467-0401. BLM maps are available from the BLM Utah Office at 324 South State, Salt Lake City, (801) 539-4001. 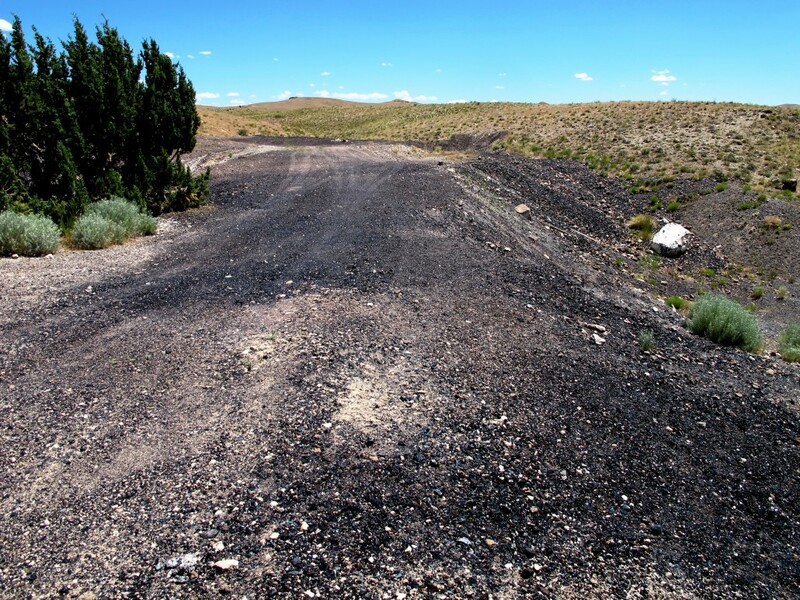 Black Spring is on BLM public lands but school trust land and private land are nearby; School Trust Land (state land): section 36 of Township (T.) 23 S., Range (R.) 9 W. and section 2 of T. 24 S., R. 9 W.; private land: most of section 3 of T. 24 S., R. 9 W. (Cudahy Mine). A fourwheel- drive vehicle is recommended but not required for travel on unimproved roads. Do not collect on marked claims. Bring a rock hammer and protective eyewear if you intend to break pieces of rock. A hat and water are recommended. Watch for rattlesnakes and cattle. Please carry out your trash. Have fun collecting!